New Batch of Migrants on Tap Tonight! Purple Martin or Wading Bird Roost? One day a neighbor child in Dallas told us that her grandmother was coming to visit. “How nice!” Mary Lou said to her. “No, it’s the other one,” she said. Happily, I was blessed with two wonderful grandmothers, both of whom left this world far too early. Both had large families, and uncles and aunts were very much a part of my life. Both grandmothers were 100% Irish. I had special names, synonyms, for both. Grandma Nora was born in the USA, as were both of her parents. Her family was distressed that she married a 100% German, a “Dutchman,” as my paternal grandfather was called. My term of endearment for her was “Schotzie,” German for “Sweetheart.” I was her first grandchild, and she always made me feel special, though I had a fearful respect for my grandfather, who seemed very gruff and demanding. He did very well as an executive with US Rubber Company, but probably suffered much job-related stress, as he was known as a “hatchet man,” who had to fire quite a few employees during a reorganization of the business. When I attended half-day Kindergarten, my Uncle Jack, 11 years older than me and a student at the high school next to my grammar school, would walk me the half mile or so to their home during his lunch hour. Their house was just about midway between school and our home. Actually, he often carried me piggy-back on his shoulders, and I enjoyed grabbing unto his generous ears. I remember Mom telling me that I was responsible for the angle of Jack’s ears, and I actually believed her. Lunch with Schotzie, usually a peanut butter and jelly sandwich and a glass of milk, was memorable because she paid me a lot of attention, and I lavished even more on the family pet. 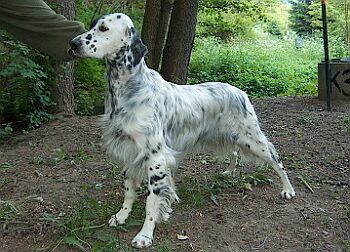 Schotzie’s family had a big English Setter named Tuck. She was docile and, I thought, very intelligent. Tuck had a collar with ID tags, but was never on a leash, and she wandered the extensive woodlot in back of the house, which I also loved to explore. The town dogcatcher knew her well, as he often retrieved her after some of her travels. Tuck knew she would be scolded for wandering off, so when the dogcatcher released her in front of the house she would creep up to the front door on her belly, a funny sight indeed! Tuck loved to swim and had an uncanny ability to smell salt water. When we drove out to our grandparents’ summer house on Long Island Sound in Groton Long Point, Connecticut, Tuck would jump out of the car a half mile before we got to the beach, and head for the nearest water. She would paddle towards our beach and be out in open water by the time we arrived there. Once she had to be rescued by a boater who found her, exhausted and clinging to a bouy, after strong tides forced her far out into the Sound. When World War II erupted, my older uncles enlisted. Louie went off as a Navy medic, to serve in the Pacific theater; Joe became an Army Air Force officer and captained a B-25 in combat over Europe and North Africa; Jerry and Jack followed them into the service as soon as they were old enough. Thankfully, they all returned safely. On Shrove Tuesday, the day before Ash Wednesday, Schotzie would bake small cookie-like pastries, hiding little objects inside each. They were the kind of things one found as prizes in Cracker Jack boxes. Mine contained a nice ring, which I promptly put on my thumb. When I got home, mom thought the ring looked rather brilliant, and on closer inspection it proved to be a genuine diamond! It seemed that Schotzie had somehow taken it off and got it mixed up with the other trinkets. She was very happy when I returned her engagement ring. Mail used to be delivered twice a day. We got to know the local mailmen, who seemed to keep the same routes for years. My favorite mailman was Amos, who delivered Schotzie’s mail. He was jolly, short and portly, reminding me of Lou Costello of the comedy duo Abbott and Costello. Amos would read all the postcards before delivering them, and my uncles would always add “Hi, Amos” to their messages. Everyone knew Amos, and he seemed to know everything about everyone. Amos would often relate the contents of a postcard as he delivered the mail, saying he would save you the trouble of reading it. He was a great jokester. The first morning after Uncle Louie returned from the war, he greeted Amos as he delivered the mail, surely expecting that Amos would be delighted to see him back safe and sound. Amos did his best to not act surprised, and casually said, “Hi, Louie—you working nights now?” Of course, they both broke out in laughter and celebrated their reunion. With a few other volunteers at the Rio Grande Nature Center State Park in Albuquerque, I led weekly Saturday morning bird walks. Their popularity and the enthusiasm of other volunteers soon allowed the walks to be expanded to both Saturday and Sunday mornings. Mary Lou started accompanying me even before she took up the study of birds. Participants ranged from seasoned birders to neophytes who were visiting Albuquerque for a convention or the Balloon Festival and were looking for a little diversion. They were of all ages, but one kid stood out. At first I did not even know Ryan’s last name, but I grew to respect his skills in finding and identifying birds. Ryan’s mother would drop him off and he often spent most of the morning at the Nature Center, birding on his own or offering help to visitors who asked questions about the birds at the feeders and water features. He also helped the researchers who trapped and banded birds during migration seasons. Ryan’s favorite word seemed to be “Awesome!’ The exclamation was not restricted to rare or unusual birds. It could be elicited by a good view of the most common species. His enthusiasm energized the other participants on the walk, making the experience all the more enjoyable and meaningful. We were always so pleased when he joined our walks, and so impressed by his knowledge and powers of observation. I remember when Ryan first got his drivers license he called me late one evening to go owling in the Sandia Mountains near our home. I was already in my pajamas, but could not refuse him. He and his younger friend Raymond met me on the Sandia Crest Road and we went on to have a wonderful evening that included their getting great videos of a Northern Saw-whet Owl at Tree Spring Picnic Area. Ryan called the bird in, and he and Raymond crept towards it, bracketing it with their flashlights. Only after the owl finally departed was the silence of the night pierced by their whooping and hollering and high-fives at a new “lifer” for Raymond. “Awesome,” indeed! Soon after Mary Lou and I obtained the cooperation of the US Forest Service to start feeding the rosy-finches at the Crest House Gift Shop and Restaurant atop Sandia Crest, Ryan came up with his own plan for a research project to study these elusive and (formerly) rare visitors to the mountains east of Albuquerque. Ryan provided boundless energy to the Sandia Crest rosy-finch project and developed a five year plan for a banding program. I foresaw his role in some day hosting a rosy-finch festival that would attract researchers and birders from all over to share their knowledge of these species. In August of last year I received an e-mail with the subject: “Dreadful news.” Before even reading the message I knew its meaning. At my age when I see a subject line such as this I expect the news to be about someone in my age group. Not this time. Ryan had been killed in an automobile accident. On the first anniversay of Ryan’s death, a memorial sculpture was dedicated to his memory and placed next to the rosy-finch feeder on the deck of the Sandia Crest House. Ryan’s mother provided me with excerpts from his journals and other readings from the memorial gathering. The best way that Mary Lou and I could express our sense of loss was to compose a Web page in his memory. Visit Ryan Beaulieu’s Memorial Page and View more Blog Posts about Ryan here. Ryan Beaulieu was a young ornithologist, environmentalist, and conservationist whose love of the earth and all its creatures and his desire to protect them was but one example of his spirit and wisdom beyond his years. He was 17 years old when a tragic accident took his life on August 27, 2005, during a birding trip in eastern New Mexico. 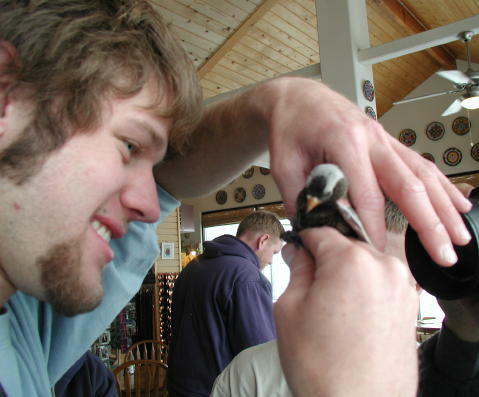 Ryan was a member of the Central New Mexico Audubon Society, New Mexico Ornithologist Society, The American Birding Association, The Rio Grande Nature Center, Rio Grande Bird Research Group, and an originator and principal bander of the Rosy-finch Research Project at the Sandia Crest. Ryan’s gift was his love for bird watching and his connection to nature. His life was filled with the joy of exploration and discovery of nature, and this sustains his family, his friends, and the birding community of which he was a part. This scholarship fund was established “to give testimony to the living legacy of what Ryan gave to all of us as family, friends, and community. My childhood world had walls and a roof. I entered my pre-teens having crossed the Delaware River only once in my life, on a trip to Columbus, Ohio when I was almost a year old. My parents tell me I took my first steps at the home of a relative in Lyndhurst, Ohio, but I certainly do not remember the event. Dad drove us out to Delaware Water Gap in the ’37 Ford a couple of times, but we did not venture across the river. We journeyed north into Connecticut to visit relatives, slithered through the Lincoln Tunnel to see the Rockettes at Radio City, and once forged eastward to Long Island to have dinner at my Dad’s employer (I have a story to tell about that trip). My Uncle Dutch hosted me for two wonderful summer vacations in Vermont: on Lake Dunmore, near Brandon, and on the working farm of the Newcombe family in Westminster West, where, not quite ten years old, I heard the church bells echo across the hayfields with news of Japan’s surrender, and felt a rush of unfettered joy as I ran my kite against the fresh breeze. Otherwise, I was hemmed in by rivers and Ocean. My cubicle had a roof. The sky stretched out, suspended from the tip of that great oak two doors down, draped over the chimney of Howie Hinckleman’s big double house out back, and stretched across the long tile roof of Union School, across Springfield Avenue. There was no north, south, east or west. To this day I cannot remember noticing where the sun came up or where it set. I never pondered why our neighborhood was called the West End. Streets were laid out in a crazy webwork ordered only by the bends of the river and the curved run of the Erie railroad “shortcut” spur. Sure, Grandpa Uriah (“Pop”) had illustrated the earth’s curvature that day when he told me of being saved from a watery death, demonstrating in gesture and quaint Newfoundland brogue how the mast of his rescuer’s ship gradually emerged above the horizon. There was also that greasy and worn globe at home, with its stark areas in the Dark Continent and Antarctica marked “Unexplored.” But no, the earth was indeed flat. The biblical creation story, based on a science understandable to desert people but not to New Jersey suburbanites, portrayed an earth and sky much more expansive than my vision. Mankind lived under a firmament, a sort of inverted fishbowl that kept out the dark waters; heavenly bodies migrated across the sphere, and floodgates opened to refresh the fields and rivers. Beyond that, the Deity offered the explanation for all else. Such a concept was beyond my ken. My stars and moon slid across the ceiling of my cubicle in two dimensions. Even on many cloudless days, my sun was obscured by smog and summer humidity. Only after I got drafted and reported for duty in El Paso did I gain an appreciation of the earth science of the ancients. Out across the Pecos River the horizon spread out as far as eye could see, and there was room to lay out the streets in an orderly grid. Most ran either east and west or north and south, and just north of town stood Franklin Mountain as a point of reference. Even at night, the radio towers at the peak and at times, the holiday star on its face, were suspended in the darkness to assure accurate navigation without map and GPS. See how the sun climbs up and across the firmament, and the constellations pinwheel on its surface around the North Star. The moon is indeed the greater light, for it illuminates the darkness, while the sun shines only in the day, when light is not needed. Science marches on. Some day, probably soon, new evidence will upset another long-held theory, just as quantum physics upset my cute high school model of atoms as little “planets” with orbiting electron “moons,” and the discovery of mitochondrial inheritance disturbed the certitude of Mendelian genetics. Each advance leads to new lines of inquiry. As we approach the limits of what is within understanding, we have two choices. We can give up and surrender to the mystery, or push on. Now I find myself much more tolerant of the ancients, with limited tools, as they struggled to understand. I am impatient with those who reject modern scientific inquiry and prefer to craft the Almighty to their limited image, as a Potter, incapable of creating freedom and chaos. They don’t seem to notice that humankind, the “greatest work” of the Creator exhibits both of these properties. Growing up without air conditioning did not seem such a hardship, as we did not know the alternative. In grammar and high school we opened the windows and used oscillating floor fans. Sometimes we could not hear the teacher over the din, but we were reasonably comfortable. The gym was steamy despite huge exhaust fans high up at both ends of the building, but that was they way it was supposed to be. Refrigerated air made its appearance in some college lecture rooms and laboratories, and became the norm in medical school. Mary Lou and I enjoyed window units in our first apartment. Upon moving to El Paso, we discovered evaporative coolers that consisted merely of a fan that blew air over wet excelsior fibers. They were noisy, but surprisingly efficient in the arid desert climate. Upon moving to New Orleans, and later to Dallas, it seemed we could not live without central air. Then, at 7000 feet elevation in New Mexico, we needed heat during the winter, but there came a day in May when we opened the windows, and they stayed open until mid-September, except when it rained. We had evaporative coolers. But we used them only a few days during the hottest afternoons, or when we had company who did not know how to adapt to the dry heat by moving to more shaded parts of the house as the sun arced across the southern sky. With the windows open, we felt a connection with the rhythms of nature. We awoke early to the songs of Canyon Towhees and Cassin’s Kingbirds in the pre-dawn darkness. Abetted by the two hour time differential from the East Coast, we bedded early after the evening news and thrilled if we were awakened by the yodeling of coyotes, the occasional hooting of a Great Horned Owl or the caterwaul of a mountain lion. Here in Florida, we operate in reverse. 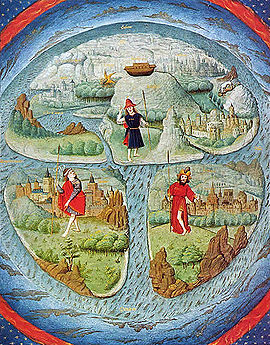 Instead of four seasons, we have only two: wet and hot, or dry and mild. Now the windows open in early November, at first only at night. By December we can forget about air conditioning and leave the windows open all the time, up until the rains begin in April or May. Though our sleep may be interrupted by the call of a night heron, it is more likely to be the trumpets and bongos of mariachis and Caribbean combos that echo across our lake. Latin culture seems to require that parties must only begin to warm up at around midnight, and certainly not end before dawn. Still, the enjoyment of fresh air usually trumps our need for undisturbed sleep. On our way to our first Birding Elderhostel, we drove out to Arizona from our home in New Mexico, staying one night in Silver City. 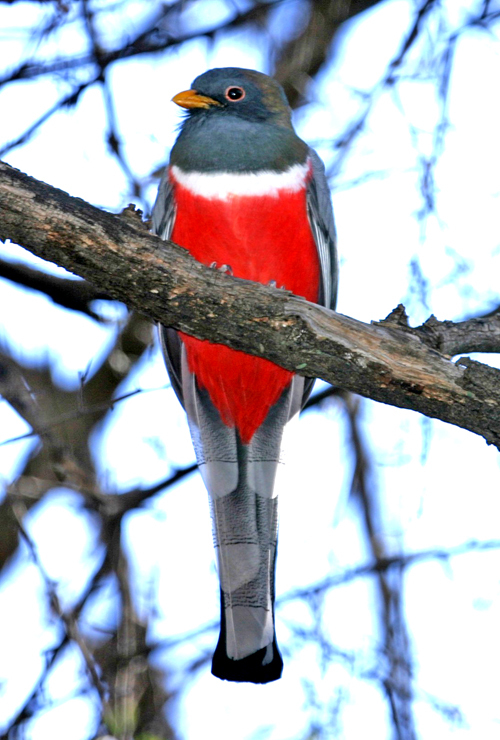 Mary Lou seemed single-minded in her quest for the beautiful but uncommon Elegant Trogon. The next morning we stopped by Portal, Arizona and visited Cave Creek Canyon, where the Elegant Trogon had been sighted a few days before. We encountered birders who had seen it earlier that day, but we did not succeed in locating one. The Elderhostel began on a Sunday afternoon and finished up with breakfast on Saturday, May 8, 1999. We saw many interesting and new birds, but we kept missing the Trogon. One day, on the grounds of Fort Huachuca, our leaders split the group so some could go on a more strenuous hike into Scheelite Canyon. We joined the mountain climbers while the couch potatoes stayed back and walked Garden Canyon. We got to see our first Red-faced Warblers and Spotted Owls, but a couple of the “lazy folks” saw the Elegant Trogon down below! A couple of other diners heard Mary Lou’s surprising statement, and said they wanted to join us. Mary Lou told them that they had to be ready to leave for Garden Canyon at 4:30 AM, or we would go without them. Sure enough, we all gathered and I drove to the fort. Just as advertised, we not only saw the beautiful male Elegant Trogon, but a female as well, and watched as she repeatedly entered and exited a prospective nesting hole. When we got home, Mary Lou started logging her bird sightings, and has not looked back since. On her “Elegant Trogon Day” I had already accumulated sightings of 474 species over 51 years of birding in the lower 48 states. Within less than 5 months, Mary Lou recorded her 100th species, a Fox Sparrow, during a birding Elderhostel in Oregon. In the meantime, I had seen only 3 “new” birds! The next year, after birding only for 12 months, she bagged a Long-tailed Jaeger in Denali National Park, Alaska (thanks to all the new birds we saw in Alaska, my list had grown to 527 by then). On October 13, 2000 she hit 300 species with a Ferriginous Hawk in New Mexico, and with a Green Parrot in the Lower Rio Grande Valley of Texas in April, 2002 she reached the 400 species milestone. Today she teeters on the coveted 500 mark—499 species to my 572. Having a new birdwatcher in the family has been a real bonus for me. No more sneaking out and apologizing for coming home late when the birding was particularly good. Best of all, as Mary Lou ticked off each new life bird, I shared with her the same sense of discovery. Even my old brain remembers her first meadowlark, almost as vividly as if it were mine. During a birding Elderhostel in New Jersey, Mary Lou spotted a male Hooded Warbler, her first, or so she thought. I reminded her that one had appeared in our backyard pond in New Mexico several years earlier, and that it was she who sighted it and excitedly brought it to my attention. “Oh,” she said, “I do remember seeing a pretty bird, but I don’t remember what it looked like.” As birders we develop “prey images” that, with experience, become quite specific, akin to the manner in which we recognize a friend or relative. Asked to draw or even describe that familiar face in detail, we fall short, yet we are certain in our identification. The art of observing and identifying is built upon repetition of the basic skills of looking and finding. See: Mary Lou Records Her 500th Bird!